This handsome 19-story red-brick apartment building at 444 Central Park West, was erected on the northwest corner of 104th Street in 1929. It has 123 apartments and was converted by Curtis Katz to a cooperative in 1976. 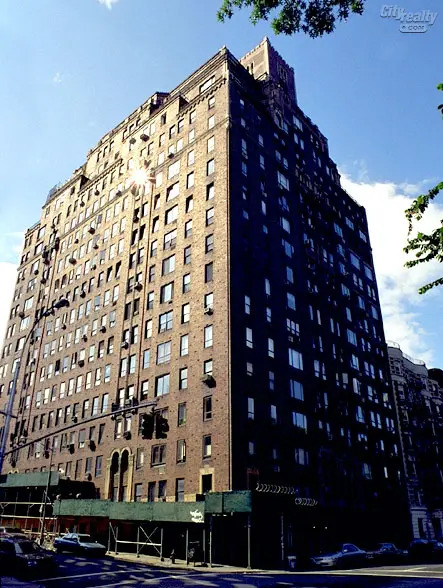 It was designed by Boak & Paris whose other buildings include 5, 22, 100 and 315 Riverside Drive, 5 West 86th Street, 336 West End Avenue, 45 Christopher Street, and the Brevoort East Apartments. A July 15, 2001 article in The New York Times by Christopher Gray was devoted to Boak & Paris. It said that Russell M. Boak and his partner Hyman F. Parisworked both worked as draftsmen in the office of Emery Roth and that's how they ended up founding their own firm in 1927. "Their early work included the apartment house at the northeast corner of 106th Street and Broadway. In the 1930's, though, their work became more inventive. They gave 315 Riverside Drive (designed in 1930 at 104th Street) definite Art Deco overtones, including strips of half-round molded brick running up the façade and unusual window grills with stylized floral motifs. In 1932 Boak & Paris designed a pink and black terra cotta movie house on Broadway near 99th Street - now the Metro Theater, formerly the Midtown." He continutes: "In 1933 they did their first building for Samuel Minskoff, an apartment house at 3 East 66th Street. Many elements of their later work appear there: elegant window grills of iron with brass trim; multicolored terrazzo floors of geometric style; varicolored marble lobby fireplaces; dropped living rooms; neo-Classical details reworked in modern style; sophisticated molded plaster ceiling decoration; and elaborate iron and brass entry doors, also in modern style." Unfortunately, Boak and Paris split up in 1942. Gray notes that Boak entered into a new partnernship with Thomas O. Raad in 1944, two years after his original partner retired. Gray notes that the new duo also contributed some inventive architecture to the city, specifically the "angular sawtooth-plan apartment buildings at 430 and 440 East 56th Street, designed for the Doelger family in the 1950s." This very elegant, pre-war apartment building overlooking Central Park at 104th Street has interesting Art Deco façade elements and wood-burning fireplaces. This building abounds with Art Deco detailing, especially of long-beaked big birds that can be found on the façades. The red-brick building has a very attractive one-story sandstone base and some sandstone window surrounds on the second floors. It has arched windows on the first floor and some on the third floor. Its attractive rooftop watertank enclosure has a crenellated top and arched windows with stone surrounds. The structure has some protruding masonry to add texture to the center of its façades as well as several set-back terraces at its top. The building has a canopied entrance and several terraces. It permits protruding air-conditioners. The building has a full-time doorman, a bicycle room, sidewalk landscaping but inconsistent fenestration and no garage. It permits pets. All apartments have wood-burning fireplaces. Penthouse D is a two-bedroom unit with an 11-foot-long entrance gallery next to a 12-foot-wide windowed kitchen with a 15-foot-long dining room in one direction and a 27-foot-long living room in the other direction. There are also large wrap-around terraces. Apartment 3A is a three-bedroom unit with a 13-foot-long entrance gallery that leads to a 26-foot-long living room and to a 17-foot-long dining room with an open and windowed 12-foot-long kitchen. Apartment 17A is a two-bedroom unit with an entry foyer that leads to a 12-foot-wide gallery that leads in one direction to a 23-foot-long living room with an angled entrance to a large wrap-around terrace and in the other to a 17-foot-wide dining room and a pass-through kitchen. Apartment 15D is a two-bedroom unit with a 14-foot-long entry foyer that leads past a 13-foot-wide, windowed kitchen to the 20-foot-wide living room. Apartment 12G is a two-bedroom unit with a small entry foyer, a long, windowed kitchen and an 18-foot-wide living room with a 30-foot-long terrace. Apartment 19F is a one-bedroom unit with an 11-foot-long entrance gallery that leads in one direction to an 11-foot-long dining room and an open, windowed-kitchen. In the other direction is a 23-foot-long living room with a 32-foot-long terrace.